I am curious is this Blanc de Chine? how old can it be? what is it worth minimal? I'm not sure it's Chinese either. Jingdezhen, China also made completely white figures of humans and animals from the 19th century to the present day. then it's older. If it's Chinese it could be from the late Qing dynasty to the republic period. 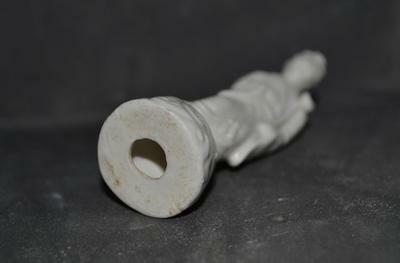 A much older antique figure would not have a base with a hole in it. Usually it would be completely hollow and some details of the figure would be hand carved and/or applied by hand. It is not possible from these pictures to know for sure whether it is Chinese or Japanese, or other. However, it looks as if it were mass-produced in a mold. 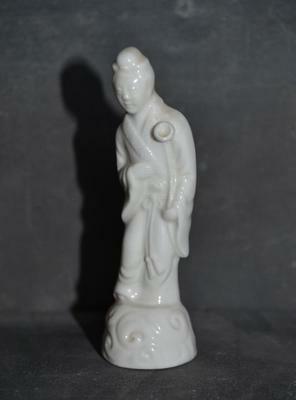 Antique handmade figurines from China are usually of better quality and detail.